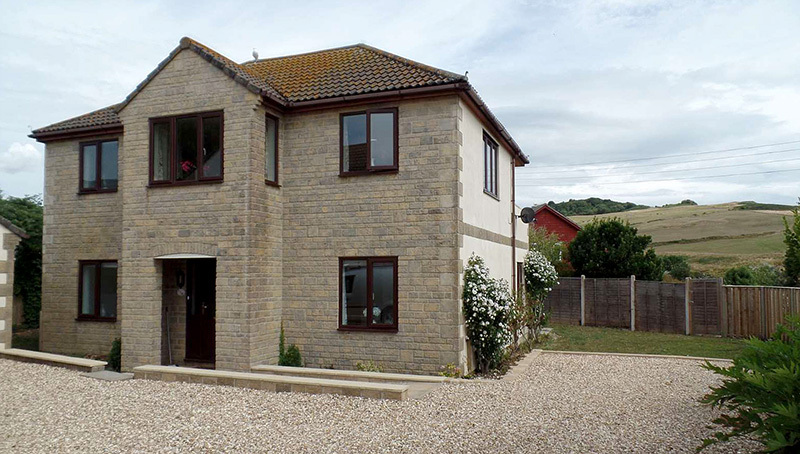 Spacious detached house, just two minutes walk from the beach and coastal path. Sleeps 7 in four bedrooms, perfect for a family holiday. Very reasonable rates for smaller parties and monthly rental is available in winter. Modern detached house with a private garden and large driveway, recently renovated to a very high standard. On the first floor is a large and light open plan living / dining room, kitchen and master bedroom with en-suite, plus a sheltered balcony with a panoramic view of the sea and Stonebarrow Hill. The ground floor has three further bedrooms (one usable as a second lounge), a family bathroom and a large utility / laundry room. There is also a large garage where fossil hunters can prepare their finds. The garden is very private and mostly a level lawn with a small terrace, perfect for games or sunbathing. 5 The Lawns, Lower Sea Lane, Charmouth DT6 6LR.